In the morning, when we get up I see our goat Bianca through the window. She is looking though the window into our sleeping room, thinking: “maybe they are up and bring me some food”… So the morning starts; and our little farming story. After breakfast I go down to the goats to feed and milk them. Our goat Bianca on our terrace. Goats need enough nutrients to give a good amount of milk. In the past, and still in some regions of this world, goats used and are kept very low profile. They are not fed at all, they were just herded in sometimes poor landscapes. The production of milk was very low and the loss of animals was high. 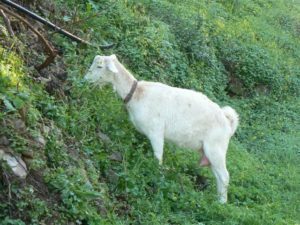 Although some people still keep their goats in the old traditional way, nowadays goats are mostly kept for a high milk production. The Dutch white milking goat who descents from the Saanen goat, gives up to 4 liters of milk per goat per day. These goats are kept inside in large barns and they are fed special food high in nutreints. We want to stay somewhat in the middle. Our goats have about a hectare of land where they can walk freely. So they can choose what they want to eat. Most of the year they stay in their area where they can eat what grows inside and where we feed them cuttings from the trees and bushes that we have to clear or prune. During the winter month (January and February) we take them through the orchard for two hours a day, which they enjoy a lot. This also ads valuable nutrients to their diet. When the early apples start to bloom we have to stop otherwise they will eat the flowers and we will be without apples. You can reed more in our blog ‘Clearing Land With Goats’. We build a shelter for the goats where they can walk in and out during the day. Attached to the shelter is our milking parlour where the goats are milked twice a day, every morning and evening. After milking the milk gets pasteurised. After it has cooled down it goes into the fridge until we have enough milk to make a batch of cheese. Most of the time I make fresh cheese but when I have too much milk I make cured cheese, like Caerphilly, Gouda or Romano. 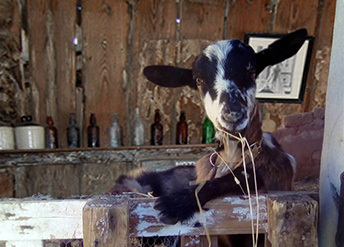 The milk of our goats does not taste very goaty when it is pasteurised straight away. It is also very creamy, delicious for making cheese with. Cheese making goes way back into the European history, long before the romans. Nobody really knows when and where it started, but I can imagine that it was a good way to deal with the not so tasty sour milk. Turn the sour stuff in something useful with a good taste. Eating cheese back in the days was not without danger. People had no clue about hygiene, things sometimes got out of hand and people got poisoned. Working clean really makes some sense. Another thing that people sometimes forget is that pasteurising milk has a purpose. When Louis Pasteur invented pasteurisation he solved a problem. People got really ill from drinking cow’s milk, it was a cause of tuberculosis. You can also get a nasty thing from raw goats milk, it is called Brucellosis and it feels like a terrible flew that takes forever. Luckily our goats are tested every year, so we know they don’t have it and their raw milk is safe. We also intent to use our own bucks for mating the ladies, which reduces the risk of infection. Pasteurising even eliminates the risk further, also I mainly use it because of the soft taste the cheese gets. 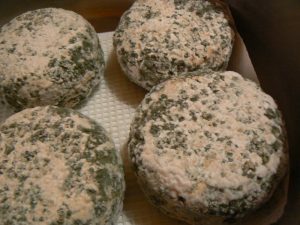 Eating matured cheese was and is never a risk in this case, the diseases disappear when the cheese is maturing. 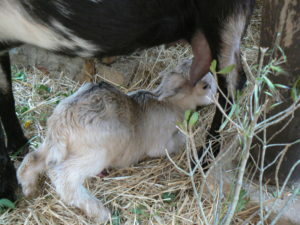 When we bought our first two goats I never had milked a goat and I never made cheese myself. Apart from some paneer, which is more like cooked milk with lemon and then drained through a cloth. No, I mean real cheese making. After reading a very good Dutch book on cheese making, ‘Kaas je kaasje’ I just started making cheese. 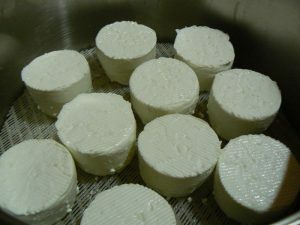 It was surprisingly easy and before I new I invented my own type of fresh cheese, which I still make today. The little booklet explains the principles of cheese making very well. It encouraging you to invent your own cheese. For making the matured cheeses I adjust cows milk recipes, this works fine. 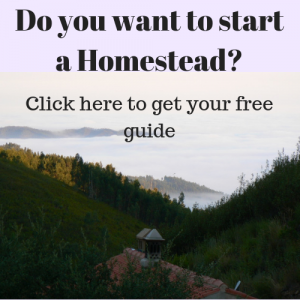 If you want to know more of how I make fresh cheese check this recipe. I have it all in a document with some pictures which I can send to you.